The Borough Under 11 team which beat the Lions. Peterborough Rugby Club’s Under 11s won the local bragging rights yesterday (April 17) with victory in the big derby game against Peterborough Lions. 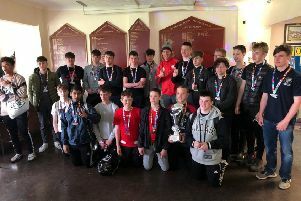 It meant they retained the ‘Local Derby Shield’ that’s up for grabs whenever the two sides meet in that age group for the third year running. “We’re all really thrilled to win this fixture again!” said head coach Simon Potter. Borough Under 11s also had half of their squad at the Wellingborough Festival yesterday, where they reached the semi-final.